I have been blogging a lot more recently because I only have ONE MORE EXAM LEFT!! woo. Anyway I thought I would do a review on the infamous Lip Butters by Revlon. Over the months, I have collected four shades which I don’t think is too bad if I’m honest. When these first came out in the USA, all the US bloggers and YouTubers were raving about them! These bad boys were everywhere! I remember watching the TV one day and the advert with Emma Stone came on and I was so excited! Naturally, I went to Boots the next day to pick one up. I really am a fan of these LipButters, because quite frankly I don’t really feel confident wearing lipstick. I really like how these are colourful, but they are like a tinted lipbalm. They are really easy to work with because of this, but also they still provide colour. Juicy Papaya is my everyday shade. I really like it because it’s subtle enough for everyday use, but it’s also just a really nice colour. It’s a sheer orangey pink colour which I find to be really flattering on me. Its the sheerest shade of these I own, but thats what I like about it. Tutti Frutti was actually the first shade I bought. It’s a bright orange colour that I love to wear in summer, or on nights out. Even though it looks quite scary when swatched, it looks really nice on the lips and you can make it subtle, or you can choose to build it up for a really high impact colour. 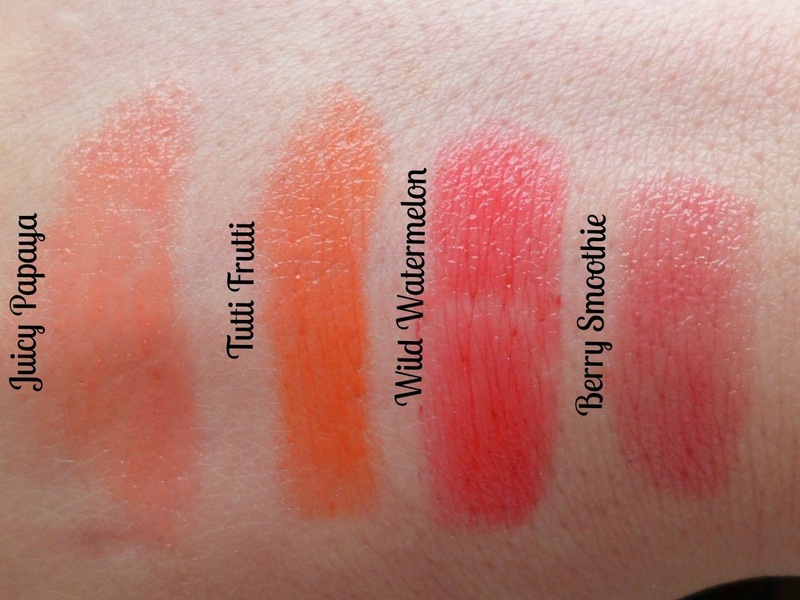 Wild Watermelon is a bright red/coral shade. This is a recent purchase so I haven’t had much chance to wear it out yet. It looks really flattering on the lips though, and you can wear it quite sheerly, but you can really build this up. ALOT. I think this shade would be good if you are looking to ‘dip your toes’ into red lips as it isn’t too dramatic. Berry Smoothie is quite hard to describe. I guess you could say its a pinky brownish colour. Some people won’t like this shade, but for me its really nice. I have really opaque lips so I find some shades don’t work for me. I like wearing this in evenings because it pulls any look together perfectly. One thing I should mention about this shade though, is although I have not photographed it well, this is the shade with the most glitter particles in. Its not too much though. Do you have any Lip Butters? What’s your opinion? I've had Wild Watermelon on my wishlist for a while now and I'm starting to want Juicy Papaya too!